You customized the layout of a Decision Data rule form through the pyEditElement section (either by adding or removing properties from the layout) and saved your changes. However, you do not see your changes in the rules that reference that decision data rule. For example, you added a new property in a layout of a Proposition rule form and saved that rule, but the change is not reflected in the strategy rule that imports the data for that proposition. 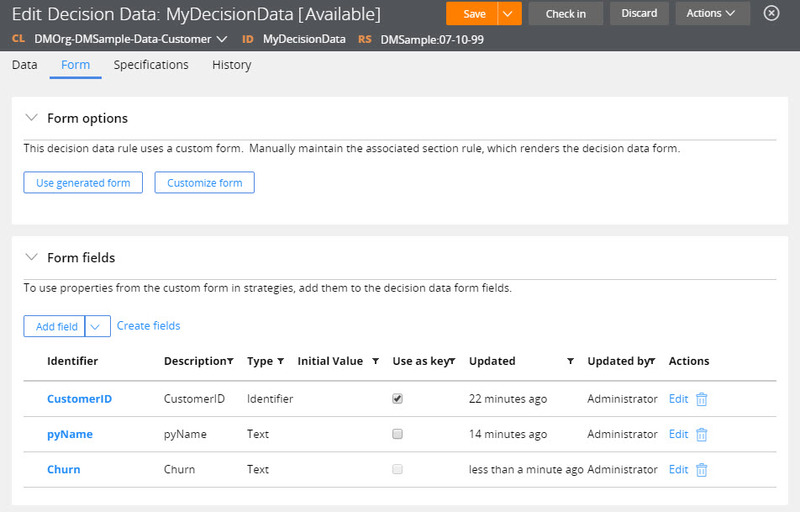 This condition applies only to decision data rules with customized rule forms. You added a property to the layout of the decision data rule, but this property is missing from the Form tab of the decision data rule. You removed a property from the layout of a decision data rule, but the Form tab of the decision data rule still contains that property. In Designer Studio, click Records > Decision > Decision Data. Select a decision data rule to edit. To unlock editing, click Check out. In the Form fields section, click Add field. Click the Down Arrow key and select a property from the list. To delete a property, in the Actions column, click the Trash can icon.